Several Otis cable-based systems are better values at somewhere around forty-five dollars for the Tactical Cleaning System with six brushes with several other variations available. Spent patches go into the garbage, where they belong, not in the washing machine. The Otis system makes it easy to properly clean your bore without complete disassembly. It is ideal for several lever-action rifles and also fixed barrel shotguns such as the Ithaca M37 DeerSlayers, to cite a couple of examples. The basic kit is extremely compact, making it ideal for range and on the road use. Rods can be clumsy, bulky, and cumbersome, but the Otis system nestles neatly in your range bag or hunting backpack. 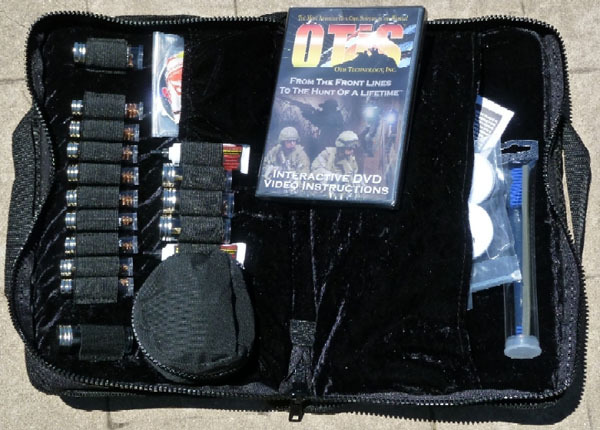 Otis also does a very good job showing you exactly how to use their products, with included DVDs on this Elite kit and also with instructional videos readily available on the Otis website www.otisgun.com. The Elite kit is fully-equipped to handle most conventional firearms from .17 HMR to .50 caliber and all shotgun gauges. Retailing for $140, you can find this deluxe kit discount-priced at around a hundred dollars. Using the Otis system, firearms are cleaned from the breech end even when assembled, using Otis brushes that are shown as stronger, thicker and do more thorough job cleaning the generic bore brush. You won't be scraping your bore with a rod, nor is damage to the crown of the barrel of any concern. The typical after-shooting cleaning is a quick one: first, a solvent soaked patch is pulled through, then a brass brush to free up more debris, then another patch or two to finish. That's about all there is to it. Frequently asked questions (with answers) are available at the Otis website. Otis product is Made in the USA, works just as advertised and makes it easy to keep all the cleaning necessities organized in one compact unit. It is a good product and does a better job at cleaning than most other methods. It is hard not to recommend an Otis system for any firearms enthusiast. For the system that's right for you, Otis has a selector guide on their website that hones in what is the most practical system for your applications. Their Tactical Cleaning System is said to be the most popular on the market today, where this system, the Elite Cleaning system, covers the bases for those with the widest variety of firearms. Copyright 2011, 2013 by Randy Wakeman. All rights reserved.